Inter-Council Collaboration is two or more Councils working together to achieve a common goal. Given the common goals and problems facing municipal councils, and the fact that local governments aren't in direct competition with each other, inter-council collaboration makes sense on many levels. One of the most common forms of Inter-Council Collaboration is Regional Collaboration. Whilst the internet and modern telecommunications technology makes it possible for far flung Councils to collaborate with each other, collaboration is often more common at the regional level where neighbouring councils often share similar problems and issues. 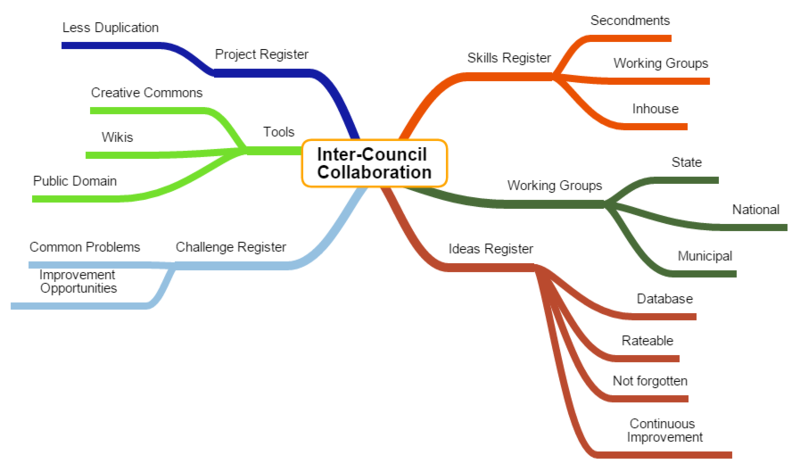 The mind map below explores a number of ideas associated with inter-council collaboration. Logically there is not much point working together to complete tasks that are better done individually, so perhaps an important first step in inter-council collaboration is identifying which tasks should logically become easier when a number of Councils work together to execute them. If you can think of a task that fits this description please add it to the list below. The following special interest groups are related to Inter-Council Collaboration. The following projects are related to Inter-Council Collaboration. The following people have indicated (via the Local Government Collaboration Topics Survey) that they have an interest and/or expertise in the topic of 'Inter-Council Collaboration' and are willing to collaborate with their peers at other councils to identify challenges and resources relating to the topic and to look for ways to work together to overcome any challenges that are identified.